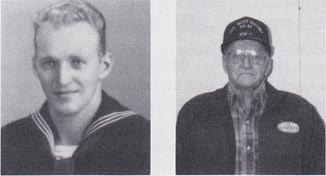 Chester Byron Tysdal, Electricians' Mate 1/c, born May 8, 1918, Halstad, 'Norman County, MN, attended school through the eighth grade and joined the USN March 9, 1942. He was stationed at San Diego, CA, and aboard the USS West Virginia (BB-48). Memorable experiences include being part of the first crew to raise the BB-48 and staying on her to the end of the war. Discharged Dec. 14, 1945, as EM1/c. Received the Philippine Liberation Medal, two Bronze Stars and the Asiatic-Pacific Ribbon w/4 stars. Married and has two children and four grandchildren. He retired from farming in 1985 and enjoys hunting, fishing and golf.